You now have the high-level story. You know the principles I had to learn before launching an agency that made a comfortable amount of money. But there’s one other thing you should know: I have a few personal traits that allowed me to turn what I learned into a high-margin company. If it weren’t for these traits, I’d probably be (happily) employed by someone else right now. Working at a regular employer was difficult for me because I could not be directly rewarded for doing good work. When you work for a company, you can do amazing work, but you’re going to have to split the reward with the rest of the company (to some degree). It’s nothing to get mad about. It’s expensive to run a company. Plus, it’s really hard to bring in the kind of results on your own that you could bring in for an employer with deeper pockets. But it does mean that in many ways, your pay is tied to what your manager thinks you’re worth. That means that if you’re particularly driven to learn and grow, your value to an employer is going to outpace what they’re willing to pay you. That’s not my preferred way of getting rewarded. I’d rather reward myself! Granted, I’m not a fan of recklessness or foolish decisions. 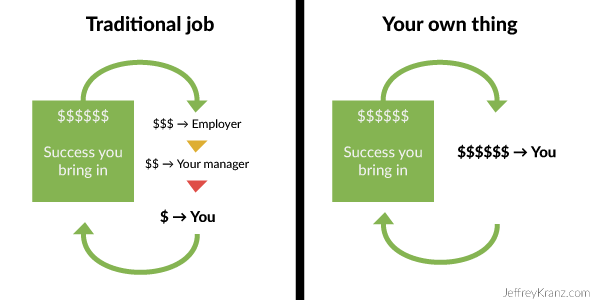 But remember how doing your own thing opens you up to enjoy the direct results of your success? Well, there’s also not much safety net if things go south. This is why I made a lot more money starting an agency than I would be making if I’d stayed at work. An employee needs a job, and relies on one employer to give it to them. An entrepreneur already has a job, because plenty of people know she’s good at what she does. Striking out on your own is a sign of confidence in yourself. You’re taking a risk with the expectation that you’re going to win—which sends the signal to decision-makers that you’re not just someone else looking for a job. This is why agencies can charge big money that employees can’t hope to ask for. Now let’s say you did what I did and grew a team of experts. That makes it easier to charge more. Objectively, your prospective client knows that they’re getting more experts adding value. But intuitively, your client realizes that you’re so good at what you do that you can afford to hire other people. When I had a traditional job, I had to ask for raises. I had to ask for promotions. I had to ask for remote working privileges and new office equipment and all that jazz. And those requests were laid at the feet of my direct superior. But with Overthink Group, if I want to make another $10,000 a month, I just need to find another $10,000 monthly retainer. Well, it’s not easy. But at least it’s possible. My chances of getting a $120,000 annual raise at any traditional job I’ve had: zero. It just wouldn’t happen. But with my own agency, I can do this (and I have). These are preferences and beliefs that I have that drove me to start my own agency. Without them, I wouldn’t have taken the leap. I share this because, if these resonate with you, then there’s a good chance you’re like me. There’s a chance that you could do what I’ve done—or maybe you’ve already done it. If this resonates with you, I’d love to hear your thoughts. Leave me a comment here. This is the first of a four-part series of posts on how I made $300,000 in billings in six months by launching Overthink Group. Don’t miss parts one, two, and three!